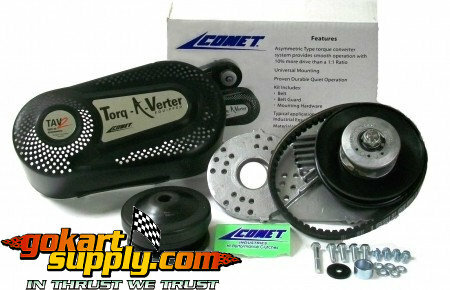 Comet 30 TAV2 Torque Converter Kits fit 3hp to 8hp engines with a 3/4" or 1" engine crankshaft. Choice of 2 different Jackshaft Sprockets. 12 tooth for #35 chain and 10 tooth for #40, 41 and 420 chain. These Kits bolt to the side of the engine. Kit includes a Cast Aluminum Mounting Plate with a Built-in 5/8" OD Jackshaft, 30 Series Driver Clutch, 30 Series Driven Pulley 6" OD 5/8" bore, Comet 203589A Asymmetric Belt, 10 or 12 tooth Jackshaft Sprocket, Hardware and Cover. This is an asymmetrical type torque converter system which means the sheave faces are non-symmetrical. They have different angles. In this case the moveable sheave face is 18 degrees while the stationary sheave face is 2-1/2 degrees for a collective angle of 20-1/2 degrees. Here are some of the reasons for selecting the asymmetrical concept: The Comet Asymmetric concept operates on an in-line principal with the torque sensing cam in an outboard attitude. This is the only system designed to operate this way, thus providing the proper alignment for the final drive chain to be on the same side of the vehicle as the P.T.O. This offers some very significant advantages to mounting requirements in many cases. 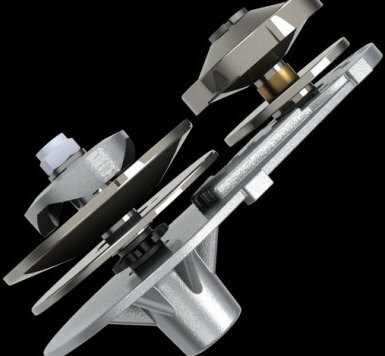 The asymmetric concept, having the 18 degree angle on one side requires less sheave travel to lift the belt to larger, comparable pitch diameters of the symmetrical system. This makes it possible to force the belt to a diameter within the drive clutch (at high RPM) that exceeds the usual 1:1 ratio of standard systems. The TAV2 can actually attain an .90:1 or 10% overdrive. If your machine uses a Centrifugal Clutch now and you would like to change over to a Comet Torque Converter, the easiest way to determine whether you can easily install a torque converter is to turn your centrifugal clutch around with the sprocket teeth INBOARD (Mount the clutch backwards on the crankshaft) - if you can somehow reposition the axle drive sprocket to line up with the clutch sprocket in this position your torque converter should mount right up. You may have to slide your axle drive sprocket about an inch closer to the motor to get both sprockets lined up properly. IMPORTANT! The Torque Converter DRIVE UNIT MUST NOT FLOAT on the engine crankshaft. It must be bolted tight against the engine crankshaft shoulder. Recommended Torque for bolt - 24 ft. lbs. to 30 ft. lbs. Max. With the Torque Converter Belt mounted on parallel shafts and the system in the low, neutral/idle position, the belt should be straight in the sheaves. The belt when straight in the sheaves should also be square to the engine crankshaft and jackshaft. The center line of crankshaft and the jackshaft must be parallel at all times. Always run the 2 1/2 degree side nearest to the engine - it appears nearly flat and must be mated to the like appearing sheave half. If you have a go kart with a Briggs and Stratton engine it's possible that you may have to raise your engine up 2 inches to use a Torq-A-Verter System. If you have a Tecumseh engine no modifications should be required. You'll have to line up the main drive sprocket on the axle or drive wheel with the jackshaft sprocket that's located in between the mounting plate and the driven pulley. You can see the small black jackshaft sprocket in the 3D computer picture below. As the engine R.P.M. increases, the Driver pulley flanges continue to close together. This action, in turn, is squeezing the belt out to a larger Driver unit diameter. This action is dependent on acceleration and lack of torque load on the Driven element, allowing its pulley flanges to open thus creating a smaller driven unit diameter. If the torque load is increased this ratio is reversed instantly and smoothly to its requirement. The ratios between low and high are infinite to meet all demands within its realm of capabilities. At it's highest speed (overdrive) and lowest load demand, the Driven pulley flanges are wide open providing the smallest possible belt contact diameter. The Drive unit pulley flanges, at this point, are closed to provide the largest possible belt contact diameter. The unique asymmetric arrangement of the belt and pulley angles allow the belt to exceed diameters possible with the standard "V" pulleys, thus overdrive. Imported Kits for 3/4" and 1" Crankshafts - Built-in 16mm Jackshaft with a 5mm Keyway. 12 Tooth Sprockets for #35 Chain. 10 Tooth Sprockets for #40, 41 and 420 Chain. Torque Converter System for 3 to 8hp Engines. Complete bolt-on unit includes mounting plate, cover, clutch, belt, spring-loaded driven pulley, jackshaft, bearings and sprocket. The mounting bolts are Metric so you may need to use Standard Hardware for your application, instead. 16mm Bore Driven Pulley, 5mm Keyway. 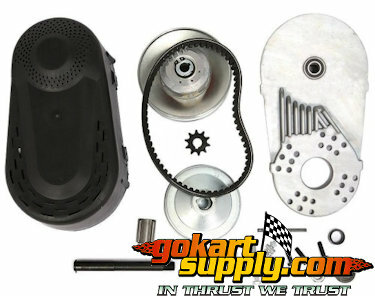 Fits American Sportworks Go Kart Model 3170, 3171, 4170, 5210 and others. Replaces American Sportworks 14706, American Landmaster 14706. Uses an Asymmetric 3/4" Top Width Belt, that's flat on the engine side. 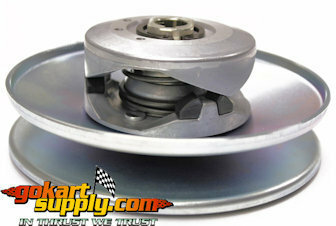 Comet 30 Series Style Pulley with a 16mm, Metric Bore.